The British Ecological Society currently funding for grants for their members and outreach activities for anyone within the Ecology field. The BES supports projects with a clear ecological focus and for new innovative research, pump priming projects as well as helping early career researchers to establish independence. Eligibility: Available to BES members only. Eligibility: Have been a BES member for 12 months. Less than 5 years full time equivalent research position post PhD/DPhil experience. Must not have a full time permanent academic post. Inspire and enthuse people of all ages about the science of ecology, especially those not previously interested. Develop skills in communicating the science of ecology. For further details about any of these opportunities please visit the British Ecological Society Website. The closing date for all of these grants is Monday 10th September 2pm if you’d like to apply then please get in touch with the research development team via our email. Categories: Funding Opportunities, Impact and Engagement | Tags: British Ecological Society | Permalink. The Parliamentary Office of Science and Technology (POST) have just launched an online survey about the barriers to engaging with Parliament specifically for academics, which we would love readers to respond to and share. The survey is 14 questions long and should take around five minutes to complete. They would welcome contributions from anyone with something to tell them, although they are particularly interested in hearing from academics from groups who engage less with Parliament: women, academics from BAME backgrounds, and academics with disabilities. After the close of the survey on 18 August, they’ll be reporting the findings on the LSE blog and elsewhere and, most importantly, they’ll be developing activities focused on addressing some of the barriers identified and supporting a wider range of academics to engage with the business of Parliament. So please, take five minutes to share your thoughts and help POST make Parliament and parliamentary processes more inclusive and representative. The survey can be completed here and closes on 18 August. Categories: Impact and Engagement | Permalink. Curiosity is a brand new £2.5m partnership between BBC Children in Need and the Wellcome Trust which will use the power of exciting and engaging science activities to create change for children and young people experiencing disadvantage in the UK. They are inviting applications for grants of up to £10,000 to fund projects that engage children and young people in science based activities. Projects should encourage young people to be curious about the world around them and inside them, making a positive difference in their lives: building confidence and self-esteem, developing life skills and expanding horizons. Applications are open now, and will close at midnight on 22 September 2017. We’ll be running events in July offering opportunities to hear more about the fund, to share your ideas and meet potential partners, including experts in science delivery in an informal setting. 28th July, 12pm-4.30pm, BBC Media City, Salford. For more information, please visit BBC Children in Need. Categories: Impact and Engagement | Tags: BBC, Science, Wellcome Trust | Permalink. After the successful first call for applications, MetroPolis are pleased to announce the second call for applications for the Chancellor’s Fellowship Scheme are open. The Fellowships are an ideal opportunity for staff who are developing potential policy-related impact linked to an evidence base in their research findings. The fellowships offer staff access to funding of up to £9,000 to cover the costs of a placement with an external organisation that can help to accelerate policy impact. Organisations can include government departments (international, national or local), think tanks, charities and businesses. 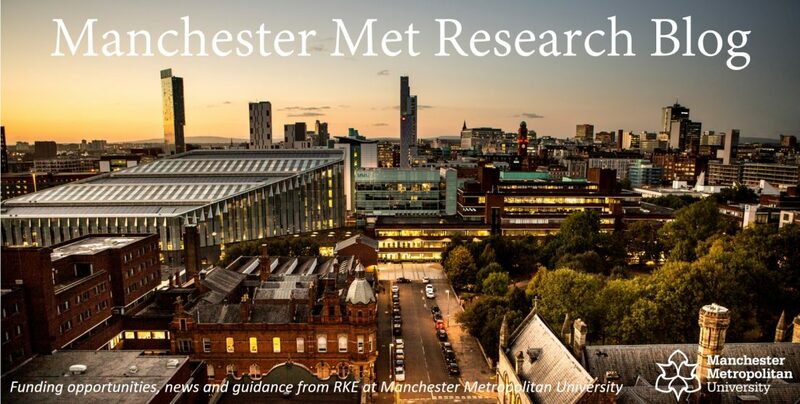 Established or establishing researchers from Manchester Met with a proven track record of high quality research with the potential to translate into policy impact are eligible to apply. For more information and to apply, please visit MetroPolis. Categories: Impact and Engagement, Researchers | Tags: Fellowship, MetroPolis | Permalink. The On Screen Talent Market at Sheffield Documentary Festival is now open for applications. This is an opportunity for experts who wish to present their subject on radio and TV. It consists of a morning of training led by TV presenters and executives, and an afternoon of curated meetings with producers, development producers and commissioners. It is designed to launch and further the careers of experts as new on screen talent. The Festival will take place in Sheffield on Wednesday the 14th June. For more information and to apply, please visit sheffdocfest. Applications close on Friday 30 April 2017. For advice, please contact the Impact & Engagement Team. Categories: Event, Impact and Engagement | Tags: Engagement | Permalink. Manchester Metropolitan University and the North West People in Research Forum invite you along to a communications workshop for public Involvement and Engagement. In conversation with public members and experienced researchers from across the region this event aims to generate discussion and ideas. This event is aimed at researchers who have had some experience and interest in Patient and Public Involvement and Engagement and the content might be of particular interest to early career researchers. Monday 20 March 2017 from 10:00am – 12:30pm. Manchester Met, Birley Fields Campus. For more information and to register attendance, please click HERE. Categories: Event, Impact and Engagement, Researchers | Tags: Engagement, public | Permalink. The BBC is looking for health experts who can explain research onscreen to a general BBC audience. They want health stories that showcase new techniques or diagnostic tools, breakthrough medicine, new findings, or new research that can shape health advice for the public. They are also keen to find institutions or researchers that might like to run a study with them, where we can support them to explore important health-related issues and demonstrate how we can live better. If you are interested please respond asap to impact@mmu.ac.uk. Please send us your suggestions for health stories, any ideas for a collaborative study and examples of any prior onscreen or other media experience. Categories: Impact and Engagement, Researchers | Tags: Health, public engagement | Permalink.